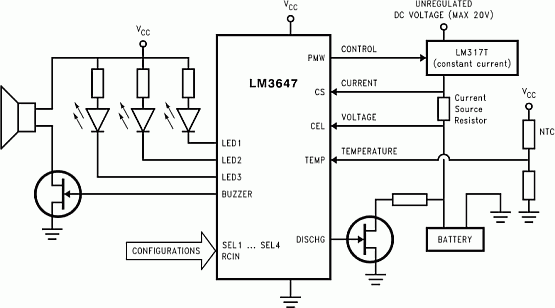 The LED indication you have explained will work just fine. I have been reading about Li-Ion batteries and feel they are the best battery for operating my Solenoid. (Large amount of output, small and compact, affordable and rechargeable) I was checking around and noticed that some companies solder an IC chip to prevent over charging and over discharging to there Li-Ion battery packs. I was wondering if this sort of chip can be integrated into the circuit as well as a male power jack so the battery will not need to be removed each time for a charge. I really appreciate your prompt replies and detailed explanations justifying your suggestions. Thanks again for your time and look forward to hearing from you again. 1. what are the voltage-current-watts specs of your new solenoid ? 2. what is the battery voltage and ampere-hour or AH that you may need. this depends on how much current the solenoid consumes and backup time. 4. The battery for operating a solenoid may be quite big and has to be kept at a distance from PCB are you aware of that. 5. solenoids may consume high starting currents like 1 A . hove you tested your solenoid on some batteries for a certain number of operations. 6. depending on these factors a circuit can be added, PCB will be a bit bigger. an external transformer or adapter is required like 15V 2A to power the circuit. 7. did you consider Nickel-Cadmium batteries NiCad also as current is more. Answers to questions are listed below. If you have any more please feel free to ask. Thanks! 1. What are the voltage-current-watts specs of your new solenoid? The battery I have in mind for this application is a custom 14.4 volt 1000 mAH Prismatic Li-Ion Battery pack. The reason I chose lithium over NICD is the Li-Ion battery packs are much smaller the NICD packs. With this battery pack I’m only looking at 30mmX30mmX48mm of space. 3. How many hours or cycles you want system to operate only on batteries? We are only looking at a total of maybe 5 minutes max a day that this circuit will undergo its duty. If I had to calculate the amount of use I would say the circuit will do its cycle 3-4 times a day for maybe 3 days a week. I am aware of the high heat out put of Li-Ion cells under continuous discharging but this will not be the case. a certain number of operations. Yes, I have tested the solenoid on a 14.4 volt 600 mAH NICD battery pack for at 15 minutes to do force, response, heat tests and it seems to keep up just fine. I haven’t counted the cycles but I would say its in the neighborhood of 100 or counting the continuous current tests. circuit-innovations are the ones who will be producing the prototype of the circuit for me and they say they can do all shapes and sizes so do what you have to do and I will check with them to see what the smallest board layout they can do is. Yes, I did but once again size does matter in this application so the smaller and more compact the better. Universal Battery Charger for Li-Ion, Ni-MH and Ni-Cd Batteries the chip costs around 6$ at digikey, and a separate circuit with some other components for that is to be made. You can integrate both circuits in one PCB if you want. do you want me to design the battery charger circuit also. I will send the revised specs after you tell me that. one more LED to the circuit that would only come on in the charging mode? plugged into the wall outlet power supply? If you have to add a 3rd LED to the circuit maybe you can use it as a low battery indicator light also? I have found a new chip LT1510 which can be on the same PCB. No LEDs are required by the charging circuit it is automatic. If you want LEDs for battery you can tell me i will add in circuit. The same battery can be used for both circuit and solenoid. But when battery becomes weak solenoid will load battery. You need to keep it plugged into wall outlet always if possible. The rest happens automatically, only replace batteries when dead. This means if you keep it plugged in the wall outlet, you can forget about it. when power fails the product will run as long as batteries have charge. when batteries are discharged the product will malfunction or fail. For this a low-battery indication or shutoff can be added. when you plug it to wall outlet it will charge. This also means if you forget to charge or the wall outlet is bad, the product wont run. Tell me how you want it to be. wall as often as possible to insure the battery is fully charged. This seems to be all the modifications to the circuit that I can think of so feel free to draw up the description and commence drawing the circuit. Thanks again for your time and sorry about all the changes I just want to make sure this circuit is going to work the best it can. . . Attached are the revised specs - ver 3 of sequential timer. Both pdf and mht formats are attached. save to computer and then study them in detail. any error or neglect at this stage will reflect in the final product. The coil electrical specs were not available in the pdf of solenoid. See what has been put in the attached specs are ok. The solenoid's rating is related to the battery's capability. The battery you have indicated limits solenoid coil resistance to 30 ohms. If the solenoid's coil resistance is say 10 ohms, we have problems. PCB and product packaging matters are to be determined by you. These details you have to give to the PCB-product designer-fabricator. The specs i give are related to schematics engineering only. your approval of specs is awaited. I reviewed the PDF description and it seems to be exactly what I’m looking for. You have my approval; you may commence drawing the circuit. I will notify the PCB designer about the solenoid spec’s when I to have them. From the ways things have been going between me and the solenoid company they are really unable to satisfy my needs so I’m probably going to go forth and design my own solenoid to fit my needs since there pretty basic. Thanks for your help; I’ll be looking forward to final circuit schematic.